It was expected to be a tight series; a series against a side that had squashed Pakistan 5-0 and most recently Sri Lanka 3-0 at home; a team boasting of the highest W/L loss ratio at home was expected to give India a run for their money and possibly expose whatever chinks in their armor. But, as it turned out, Virat Kohli's men showed that despite their deficiencies in the middle-order, why they are the most revered side at the moment. 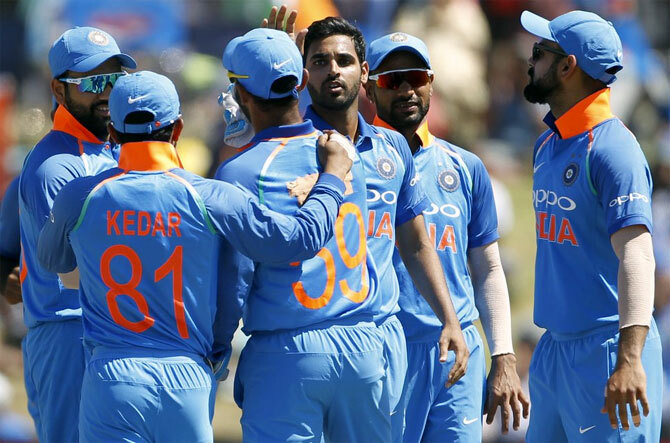 And, the third ODI proved to be no different, as the Men in Blue closed out the 5-match series with disdain at Mount Maunganui with courtesy a thumping seven-wicket win. That the Kiwis failed to bat out their quota of 50 overs for three times in a row tells you how relentless the Indian bowlers have been with their line and lengths. There was a similar template with the Indian bowlers challenging the Kiwis with their discipline at different stages of the game. Throughout the series, the Indian bowlers have grappled the Kiwis with questions rarely asked in ODI cricket these days, and the top-order failed once again. Colin Munro, after a brief attempt to curb his natural instincts, threw his hands at everything, and eventually gave a catch to first slip off Mohammad Shami. 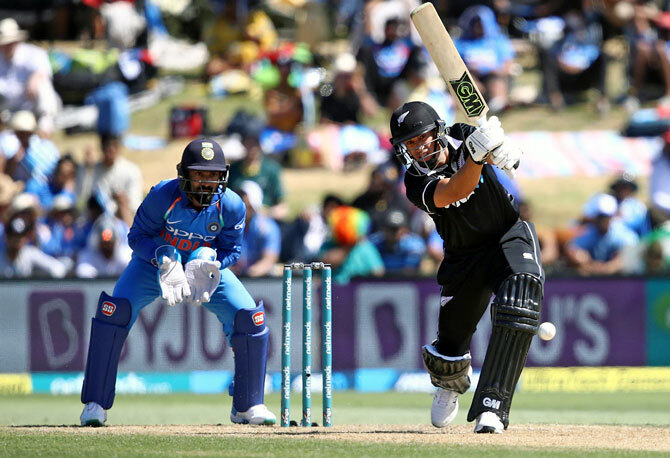 Martin Guptill did the same off Bhuvneshwar Kumar and when Hardik Pandya took a flying catch at short mid-wicket of Kane Williamson, the hosts found themselves reeling at 3-59. But, for the first time in the series, New Zealand middle-order stood up as Taylor  and Latham stitched a 119-run stand for the fourth wicket. Both the batsmen negated the threat of Chahal and Kuldeep- especially Latham, whose footwork against Chahal was outstanding. But, the left-hander perished to Chahal against the run-of-play to give India an opening. 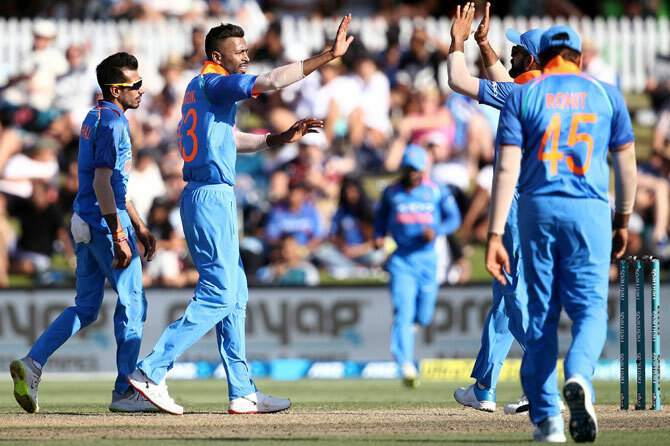 Hardik Pandya's return to the side gave India a much-needed balance and the all-rounder bowled valiantly to chip in with wickets of Henry Nicholls and Mitchell Santner. Ross Taylor threatened to cut loose with Doug Bracewell, who had scored a fifty in the last game but Mohammad Shami's in-between length sucked the right-hander into a late cut which he ended up edging to Karthik. The rest followed suit as New Zealand lost their last seven wickets for 65, to end at 243- 25 runs below the par-score. Shikhar Dhawan kickstarted India's chase with a breezy 27-ball 28, taking Doug Bracewell for three consecutive 4s in an over before perishing to Trent Boult at first slip. Rohit Sharma  and Virat Kohli  consolidated the run-chase with yet another 100+ run stand- 16th in 70 innings. The duo successfully negated the threat of Mitchell Santner on a pitch that had slowed down in the second half before teeing in Ish Sodhi to break open the game. By the time, Sharma perished to Santner by again trying to put him off his length, to be out stumped, India just needed 92 runs off 127 balls. 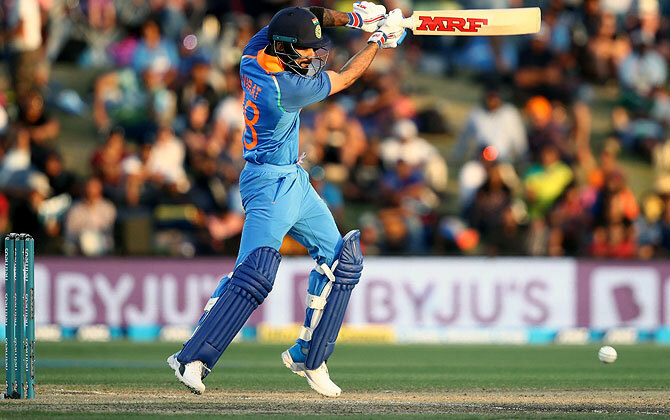 A slower ball from Trent Boult brought about a rare Virat Kohli's dismissal between 50 and 100 but an unbeaten 77-run partnership between Dinesh Karthik  and Ambati Rayudu  steered the Men in Blue to their 6th bilateral ODI series [out of seven] away from home with two matches still to be played.